David Harvey is a renowned geographer and an influential man. He is Distinguished Professor at the City University of New York, director of of its Center for Place, Culture and Politics, and author of numerous books. Harvey’s been an anthropologist and, according to the CV attached to The Enigma of Capital, and the Crises of Capitalism, he is “the world's most cited academic geographer”. He has also been teaching his course on Karl Marx's Capital for nearly 40 years, sometimes two or three times a year, and has consequently acquired a deep and detailed knowledge of the work. His 13-part series of video lectures on the first volume of that most famous of books has been downloaded more than 250,000 times since 2008. There is much more in the book that we can learn from since there’s a great deal of descriptive, if impressionistic detail about the appearance of the aspects of the crisis around the world, informed by many contemporary sources. Harvey draws authority from many historical figures in the world of political economy in his analysis of the causes of the present crisis. There's positive and negative in Harvey's ambivalent, long-standing relationship with Marx. On the plus side is the dogged determination to continuously find new sides to Marx's work, studying it with successive groups of students from many different disciplines, bringing their insights drawn from exposure to new experiences and knowledge. And no-one could accuse Harvey of dogmatic insistence on a “correct” reading of Capital, or an insistence on remaining “true” to the content of a 150-year old publication. 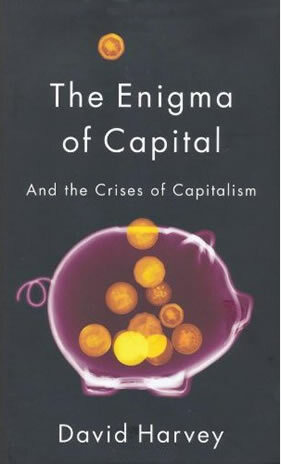 Marx himself delayed publication for many years as he reworked his material in the light of new developments in the contradictory evolution of the already crisis-ridden system. He would have been doing the same today, feverishly consulting the vast array of official statistics, reports, and theoretical interpretations available through the revolutionising medium of 21st century communications technologies. Harvey is a deliberate anti-dogmatist, taking issue, for example, with “workerists” who insist on the factory-based proletarian struggle as the basis for opposition to capitalism. Instead he presents a broad overview of the global movements that could comprise a unified opposition. But, on the negative side, Harvey risks throwing the baby out with the bathwater. In the second of his 13 lectures, for example, he distances himself from Marx's fundamental materialist premise that the economic structure of society, the mode of production, determines the character of and is the foundation of social, political and intellectual life generally. Marx’s approach helps us to understand the nature of the capitalist state. But this, says Harvey, was “an inspired idea that ultimately fails”. In his efforts to negate Marx, Harvey has adopted a method which has the appearance of scientific completeness, but is deceptively selective, and it is dialectical but only in so far as it suits his purpose. Harvey uses selected extracts of Marx against Marx himself, offering his own conceptual framework as a superior tool of analysis. With many years as a scientist specialising in geography and anthropology, Harvey's view of the subject matter is detached and objective. No bad thing. Throughout the book there's the feeling of seeing the world from a helicopter or a spotter plane, sometimes high up, sometimes swooping in to look more closely at the profusion of detail. Sometimes it would be good if he touched down and gave us a more powerful feeling of the unfolding global catastrophe. I’ve looked, but can’t find anything in Marx that supports this characterisation of “capital flow”. Harvey has searched high and low for Marx’s authority in support of the seven “activity spheres” that form his “framework of thought”, and he claims to find six of them lurking in one sentence in a much longer footnote to Marx’s chapter on machinery and modern industry. It’s a pretty thin basis for a different way of thinking. The analytical framework of seven activity spheres isn't unique to Harvey. It has been in use in management circles for many a long year, doing the rounds of the organisational development departments of global corporations and public sector organisations. Not a bad thing in itself, but the question is, is Harvey improving upon Marx’s dialectics? Does his framework lead to different conclusions? Does it help to formulate the organisational forms, policies and actions needed to effect the change from a worn-out bankrupt destructive capitalist system to one based on social ownership? Not in this book at least. So, to reiterate, What is to be done? According to Harvey it's alright to start anywhere and do anything as long as we don't leave things as they are. “The trick is to keep the political movement moving from one sphere of activity to another on mutually reinforcing ways.” Despite some radical sounding paragraphs that follow an inventory of the various oppositional social movements, Harvey offers no concrete solutions, no specific policy proposals. Harvey just hopes for a coalescence of the various movements he describes without any idea about how that might be brought about, except by the action of millions of individuals he optimistically describes as communists. His opposition to Marx’s life of struggle to build a political movement to lead revolutionary change is outrageously misinterpreted. So the Manifesto doesn’t leave Communists without a political party, it just didn’t propose another, separate one at that moment in history. The Manifesto was written by Marx and Engels in response to a request from the International Working Men’s Association and was part of a deliberate attempt to create a unified revolutionary leadership. Harvey fails to mention this. Harvey certainly asks the big questions in his book and lectures, leaving concrete policies and action to the reader.